The idea of an All Saints Day cleanup is to undo the mess created by miniature ghosts and goblins on the night of Halloween. You can get the area looking smart again and raise money at the same time. The is a great Halloween fundraising idea that is creative and gets the kids up after all of their candy the night before! The first step is to put together a flyer explaining something about your group and the cause the funds are going to. 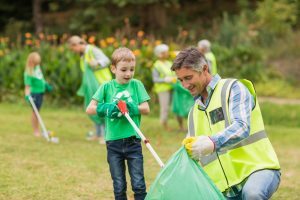 You can advertise locally using simple signs and place an ad in the local newspaper, alerting residents to the fact that you'll be cleaning up yards in return for a donation. On the day after Halloween, venture out with rakes, garbage bags and some strong gloves. Tour round the local neighborhoods and keep an eye out for yards that look a mess. Knock on each door and politely ask the homeowner if they would be interested in having their yard cleaned — you can hand out another flyer and explain what your group is up to. Something as simple as raking leaves can be enough reason to knock. Before you get to work make sure you have agreed with the homeowner how much you are prepared to do. The homeowner might want you to take your trash with you or offer you a place to put it. Make sure the homeowner has chance to inspect your work before you go and express your thanks verbally or with a note. This fundraiser can be done with just a few people or you can make it a bigger event and tackle your whole neighborhood.